Plant cells are eukaryotic and have many of the structures found in animal cells. Link to pages describing these. The electron micrograph shows cells from a sunflower leaf. It was supplied through the courtesy of H. J. Arnott and Kenneth M. Smith. Chloroplasts are the most familiar plastids. They are usually disk-shaped and about 5-8 µm in diameter and 2-4 µm thick. A typical plant cell has 20-40 of them. Link to page on chloroplast structure. Chloroplasts are green because they contain chlorophylls — the pigments that harvest the light used in photosynthesis. Chloroplasts are probably the descendants of cyanobacteria that took up residence in the ancestor of the plants. Link to discussion of the endosymbiotic origin of chloroplasts. storing the carotenoids that give flowers and fruits their color (when they are called chromoplasts). Link to a picture showing how fibrils of cellulose are deposited in the cell wall. The linear nature of cellulose molecules and the many opportunities for side-to-side intermolecular hydrogen bonding provide just what one would want to build long, stiff fibrils. The cell walls of parenchyma and meristems are uniform in thickness and are primary cell walls. Although each cell appears encased within a box, in fact primary cell walls are perforated permitting plasmodesmata to connect adjacent cells. have secondary deposits of lignified cellulose which provide mechanical strength to the tissue. maintain turgor in the cell. Plant cells avoid bursting in hypotonic surroundings by their strong cell walls. These allow the build-up of turgor within the cell. Loss of turgor causes wilting. When a freshwater (or terrestrial) plant is placed in sea water, its cells quickly lose turgor and the plant wilts. This is because sea water is hypertonic to the cytoplasm. As water diffuses from the cytoplasm into the sea water, the cells shrink — drawing their plasma membrane away from the cell wall. 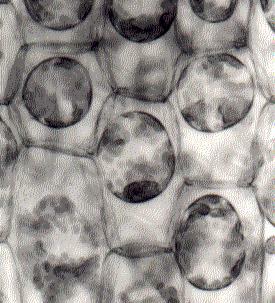 The photomicrograph shows plasmolyzed cells in the freshwater plant Elodea which has been placed in sea water. Note how the cell walls now show clearly.